In 1938, Hong Kong Mines Ltd, under the management of Mr Laurie Nielson, established Lin Ma Hang as a modern and efficient lead mine. However, the Pacific War and occupation of Hong Kong by the Japanese resulted in the mine falling into ruin. The processing equipment was removed and the tunnels stripped of all valuable apparatus and temporary support, leaving the mine in an unsafe condition. In the sensitive post war environment, the threat of communist insurgency resulted in stringent constraints placed on the mine by the Colonial Government. Compounded by a shortage of capital, a drop in the price of lead and labour disputes, the mine never recovered its former glory. This article discusses the abandoned mine workings at Lin Ma Hang. These workings are extremely dangerous with unsupported tunnels, open shafts and unstable storage of mine waste. The workings should not be entered. With the approach of the Japanese and the militarisation of the boarder, the mine was closed by the end of 1940. Following the Japanese assault on Hong Kong in December, 1941 it took a further nine months before the Japanese started to explore the mine. 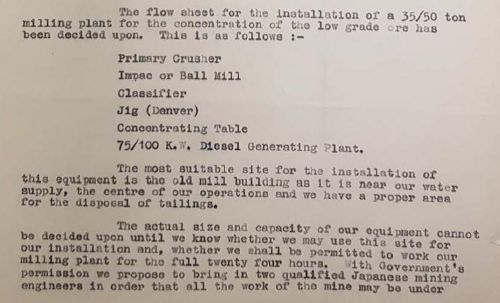 A report in September, 1942 noted that Japanese engineers inspected the mine and mineral processing machinery. By November, 1942 production resumed at the mine with 200 men working in the tunnels and on the surface. Given the importance of the lead to the Japanese military, the British Army Aid Group (BAAG) considered the mine a legitimate target and in 1943 plans were developed to destroy the power generators to the mine. However, the Chinese authorities did not consider it a priority and the British could not proceed without the Chinese support. By March, 1943 the border was reinforced with 25 troops stationed at Lin Ma Hang, thwarting plans by Major Ueo of the Kuomintang forces to raid the mine for the stocks of dynamite. In July, 1944 work at the mine was suspended due to the lack of electricity, and on the 1st September, 1944 local villagers were forced to load 12 trucks with machinery from the mine. 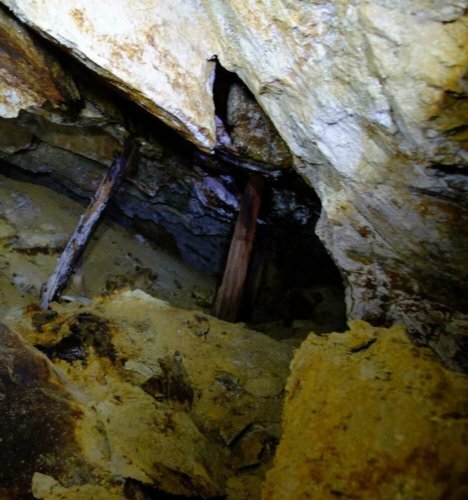 One report suggested that the machinery was relocated to the Castle Peak Mine. However, at the first shareholders’ meeting following the war, it was reported that the machinery was taken to the mines in Hainan. During this war period, the Japanese worked the easily accessible areas of the mine, and excavated a new level between the pre-war level 5 and level 6. This new level was found to be very dangerous to operate as there was insufficient clearance between levels, resulting in the collapse of the level above arising from a blast. It is reported that the Japanese extracted between 30,000 and 40,000 tons of ore during the war, mostly from the level 1 and 2 workings. They used basic mining techniques, extracting readily available ore including from the roof supporting pillars, resulting in roof collapse. In the immediate aftermath of the war, the mine became unattended, and it would seem that the opportunity was taken to strip the mine of all valuable assets. In an October, 1946 report by Mr George T Scholey, the pre-war General Manager for Nielson & Co, he recorded that, “the very considerable damage to the mine was done after the Japanese surrendered”. He noted that windows, floors, doors and all electrical and plumbing fittings had been removed. The mill was stripped bare, all the equipment except the ball mill and the frames of two crushers had been removed, and even the ball mill had been stripped of its motor and gear drive. The roof trusses and window frames from the mill and workshop buildings had been taken and all electrical equipment, including insulators and power lines, had been stolen. Most of the rail tracks had been removed, both underground and on surface. The mine owners assumed the villages of Lin Ma Hang had looted the mine, souring relations for many years to come. 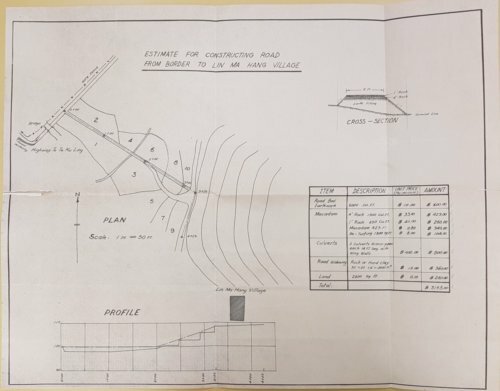 He may have been correct with his accusation, but the village was well respected by the District Commissioner, Mr J Barrow who wrote in a memo regarding the re-opening of the mine in May, 1951, praising the village for helping an escaping prisoner of war Captain I B Trevor. Following the war, Hong Kong Mines held their first company meeting in June 1947, at the Gloucester Hotel. The company had few resources and the Company Share Register had been lost during the war. It was not possible to compile a new register and a notice had been published in the press in September 1946. Very few shareholders responded to re-register their share ownership. Until new legislation was passed; the company could not issue new shares. Mr Scholey had visited the United States to seek a backer to take over the mine, but there was no interest. A detailed claim had been submitted to the authorities for reparations to cover the damage to the mine, loss of equipment and loss of profit on the ore removed by the Japanese during the war. Given the poor situation of the company and the shortage of qualified mining staff, Mr Scholey recommended that a contract miner be paid on a royalty or profit share basis to work the mine. During this period, Hong Kong Mines, continued to sell left-over ore from the mine, 100 tons in 1947 and 16 tons in 1948, coving the costs of the mine’s upkeep and security. 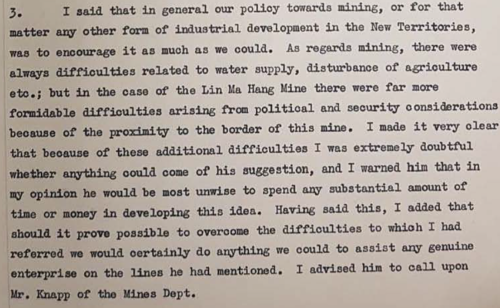 In 1949, the British Secretary of State urged Hong Kong (amongst others) to develop lead resources to earn hard currency and to meet the shortage of lead in the United Kingdom. The Colonial Government decided to sponsor a move to get the mine back into operation. Following a review by a number of respected parties, including Dr S G Davis, it was estimated that rehabilitation costs would be around HK$976,000. 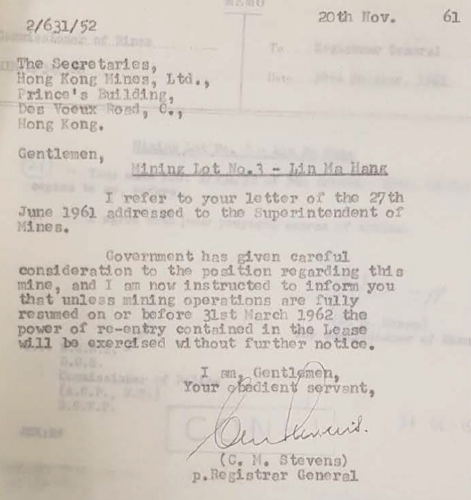 On the 23rd June, 1949 a letter was sent to Hong Kong Mines advising the Government would re-enter the Lot unless they re-commenced production. The mine was ready to re-open in April, 1951 and which included a proposal to extract ore from the Chinese side of the border, to be reached by a tunnel under the river. However, wider border security issues were now of a concern and to solve the problem of cross-border crime and increasing illegal entry into the Colony, the Frontier Closed Area Order, 1951 was passed on the 27th June, 1951. This imposed limitations on access to the area and a night-time curfew between 12 midnight and 4 am. New restrictions were also to be imposed on the mine workings. • ore to be securely stored on site before off-site processing. With the new conditions in place, the mine reopened in November, 1951 operated by Tonley & Co Ltd on a short-term operating agreement. In the first six months, the mine yielded 928 tons of lead ore, but the limit of 100 men was insufficient to operate the mine efficiently and the mine operator requested the limit be raised to 500 men. 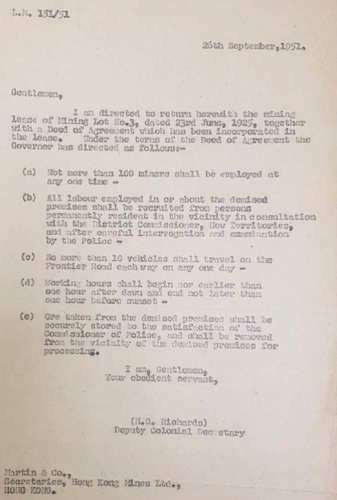 In a letter of the 2nd November, 1951 it was noted that there were four villages within the “Closed Area” with a potential work force of over 1,000 men, all with closed border permits. A review by Mr J Barrow, the District Commissioner, indicated that the number of men in the area “fell far short” of the figure quoted and it seemed that the operator was hoping to employ “Chiu Chow men now out of work which they formerly had at the road bridge at Man Kam To”. The request was rejected. On the 1st May, 1952 the contract with Tonley & Co expired and work at the mine was once more suspended, with just one employee and two watchmen left to look after the mine. On the 18th August, 1952 Hong Kong Mines, signed an agreement with Foo Yuen & Co to operate the mine for 12 months. The authorities were not happy about using the existing border road for access to the mine. A number of alternatives were discussed, including a dedicated railway or a new high-level road access. Following discussion with Government representatives, it was agreed that access to the mine would be through the Lin Ma Hang village, screened from the border and under the protection of the local police post. Foo Yuen & Co developed a scheme to provide the new road access to Lin Ma Hang Village from the existing border road. The construction was then discussed with the villages, and Hong Kong Mines paid them HK$6,500 for the land and construction. With limited capital investment, basic mining methods were adopted. Working around the abandoned buildings of the pre-war operation, the men made do with whatever they could find. The blasting holes were drilled by hand and the ore carried out of the adits to be processed in a hand-operated riffle board and sluice. With these techniques, around 50 tons a month were produced for export to Belgium where it was smelted. Following a dispute with Foo Yuen over their approach to mining, by 1955 Hong Kong Mines had taken control of the mining operation. They requested the Deed of Agreement be revised to allow, the installation of a 35/50 ton crushing plant, the Company to engage Japanese mining engineers, and the employment of labour from outside the local vicinity. As noted by Mr L R Nielson in a letter to the Superintendent of Mines in July, 1955, “we have recently lost our best miners to government projects” and requested at least 50 more men. They also sought approval for the storage of the ore in the old Hong Kong Mines Office rather than in unprotected stores in Lin Ma Hang Village. The Commissioner of Police, had no objections to all the request other than the employment of Japanese mining engineers, he objected to them on “security grounds”. 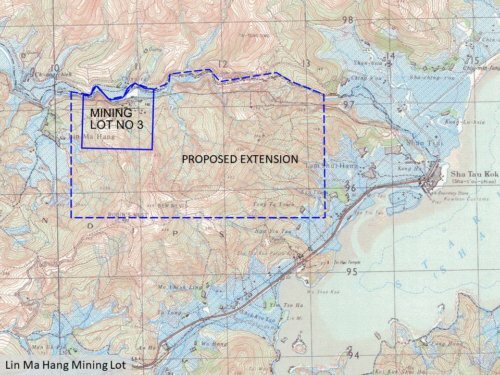 Following discussion, this objection was withdrawn and Hong Kong Mines was given the assurances that it had requested. In the second half of 1956, the mine suffered a number of industrial disputes with the workforce resulting in a labour strike in July. To ease tensions, a new recruitment system was implemented in September, 1956, with the Village Elders controlling the supply of labour. This resulted in a significant drop of production as the Elders withheld labour that had not joined their society. The company complained that they were unable to control the workforce. By the end of 1956 production at the mine had ceased. 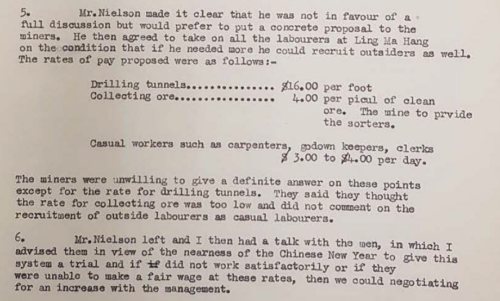 On the 21st January, 1957 a meeting was held between Mr Nielson, miners and village representatives, supported by the District Office and Commissioner of Mines. Following the intervention of the District Office, the labour dispute was resolved and work resumed at the mine. 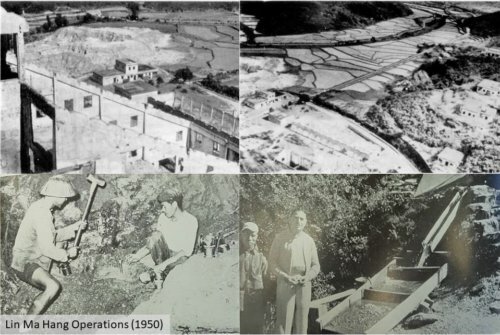 Following the expansion of the mine operation in 1937, Hong Kong Mines wished to expand the original land allocation of 150.15 acres. An area of 1,196 acres was identified and discussions took place on and off until August 1958 when the company approached the Government. The Police objected to the proposal, “any extension to the mining area would mean employing additional labour, and any repetition of the Lin Ma Hang Village labour dispute must be avoided at all costs”. In July 1958 the price of lead dropped from £140 per ton in 1951 to less than £70 per ton and the mine was no longer tenable, and work was suspended until the price rose. During the summer of 1961, Hong Kong Mines discussed a merger with a Filipino company who was willing to invest in the mine. However, under the lease agreement, if there was no mining for 12 months, the Government had the power of re-entry and take control of the mine. The company was given until the 31st March, 1962 to reopen the mine or the government would take over the mine. Production did not resume and on the 13 April, 1962 a notice was registered by the Government for re-entry. In September, 1962 Hong Kong Mines lodged a petition with the Governor to repeal the re-entry on the grounds that Macarthur International Mineral Company, Inc of Guam, based in the Philippines was ready to invest in the mine. They requested a six-month extension to complete the merger discussion. With lead at £52 per ton, Government could see no obvious commercial case to withdraw the re-entry notice. A detailed petition was submitted by Hong Kong Mines in March, 1963 to support its request. The request was reviewed by the Governor in Council on the 6th August, 1963 and the request for a delay in the re-entry was rejected but the company was given additional time to appeal. Following the re-entry, in January 1966, Tai Po District Office awarded a contract to Chong Tai Construction to demolish the dilapidated buildings on the site as they were in a dangerous condition. Following the failure to pay Crown rent or undertake active business, Hong Kong Mines was struck off the companies register in 1968. On the 8th November, 1968, with no further appeal from the , the Government once more formally took over the mine through the process of re-entry on the grounds that the company had failed to pay Crown rent for the previous two years. In September 1958, Mr W Y Clarke, a representative from Placer Development Corporation, a large Canadian mining investment group, was in Hong Kong for negotiations over the Ma On Shan mine, but these fell though. The company was interested in buying the Lin Ma Hang mine, and in expanding the scale of the operation. The District Commissioner, Mr D R Holmes, made clear that it was unlikely that mining would be allowed to resume in the area. In March 1964, a Japanese firm expressed an interest in the mining lease but was advised that mining would not be allowed due to security concerns. The mine today is abandoned and lost to vegetation. With the opening of the Frontier Closed Area, walkers and explorers have been visiting the mine, but great care is required due to the unprotected shafts, drops and entrances. The Government has started installing steel barriers on the most popular entrances to prevent trespassing. There is no current estimate for the remaining ore reserves, but based on the 1940 estimate of 120,000tons it is likely that over 100,000 tons of lead ore remains within the hills. With a 10% recovery, this would equate to 10,000tons of lead. The mine failed as a result of poor market conditions, lack of capital, and Government imposed restrictions. With the current price of lead at HK$18,524 per tonne (May 2018), it makes you wonder if the mine would be economic in today’s commercial climate. This article was first posted on 30th May 2018.